We ate this as a side dish to dinner and it was sooooo tasty! I had to throw “Spring Time” in the title because it screams spring and it screams fresh! I love the asparagus, fresh tomatoes, tangy onion, and buttery chickpeas. It all comes together with a blend of pesto, balsamic vinegar and freshly cut parsley. Seriously, folks! It’s deeeeelish! I’m loving the fact that I have leftovers. Speaking of leftovers, this could easily be made into a main dish by adding some chicken to it. I think I’ll have that for lunch tomorrow! Yum, Yum! Rinse quinoa. In a small saucepan, cook the quinoa in the chicken stock over medium-low heat, covered, for 15 minutes, or until liquid is absorbed. Meanwhile, prepare all other veggies and herbs. Toss them together in a large bowl. In a smaller bowl, combine the balsamic vinegar with pesto until smooth. 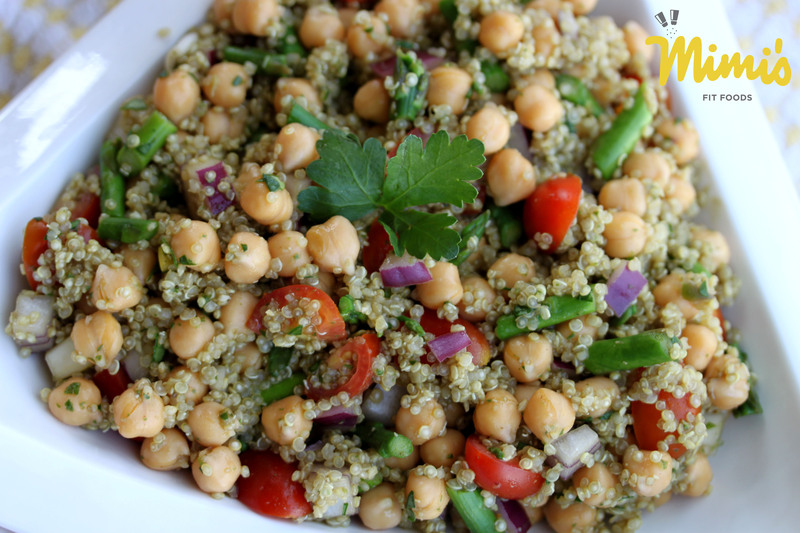 Pour it into the large bowl of veggies, along with the chickpeas, quinoa, and asparagus. Stir to coat and season with sea salt and black pepper, to taste. Serve the salad warm or cold. Enjoy it immediately, or store it in an airtight container in the fridge for up to 5 days. I am so sad! I love all the quinoa recipes, but broke out in a rash from it! What can I substitute for the quinoa? Sad! I have rarely heard of people with an allergy to quinoa. You could try substituting couscous or even brown rice. The flavor and texture will change a little, but should still resemble the original recipe.